Dunes Music Festival 2019: Three days at a fantastic beach resort, cool breeze, and, most importantly, a wide range of fabulous music that can channelize your body and shake your soul! And all this on the weekend of Valentine! Does this idea excite you? If yes, then really something big coming up for you! The most popular festival in the EDM, the Dunes Music Festival is back! DMF is a celebration of new generation music. This is a platform that displays new talents that come forward to amaze you with their skills in electronic music, including trance, dubstep, and bass drops. Dune is a phase that presents the Indian EDM artists to the youth in India and around the world. This year, Dunes Music Festival has returned as Dunes Beachland and the excitement is folded two times. The very first edition will be held in the grand and stunning Havelock Island of Andamans. About EDM And Dunes Music Festival 2019. EDM or Electronic Dance Music has been assembled and is intended to address a large group of dancers with a wide range of sounds. It originated from the 70s when EDM was enjoyed in the form of popular disco and synthpop electronic dance music, and the 2000s saw EDM in its much more defined way. Its popularity has multiplied over the years and now becoming a thing in India. 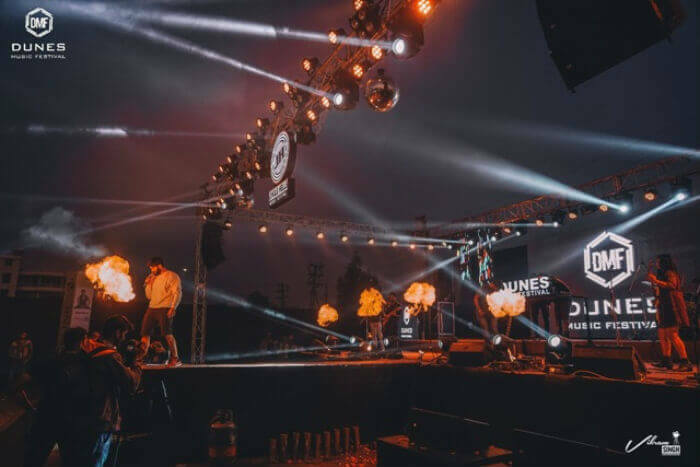 Along with shaping many concerts in India, the Dunes Music Festival is completely dedicated to the EDM. Dunes strongly believe in music, not in type or genre. The idea is to celebrate music in its entirety and not to divide it and restrict it. This is a beautiful and harmonious fusion of different styles. Dunes adjust every form of music, whether it’s Electro, Trance, Dub Fusion, Ambient, Drill, and Bass or even Acid Jazz. DMF was established back in 2016 and now the festival has so far given three successful annual editions. Dunes Beachland is another exciting concept where shows will be hosted on a beach. Have the glimpse of music waves dancing along with competing with the rhythm of sea waves. This is the first version of Dunes Beachland and it has been correctly scheduled for Valentine’s Weekend. In fact, the organizers have already started planning for the second edition too, which will be held at the Mandarmani beach near Kolkata, West Bengal. 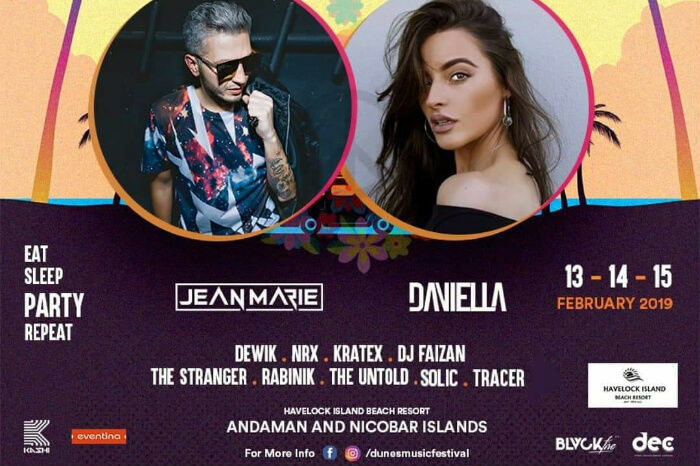 Dunes Beachland 2019 by Dunes Music Festival is going to be one of the refreshing and coolest events in Andamans and an epic event in the history of EDM in India. And you talk of India, it’s not just about the mainland, but also about the Indian islands. Dunes Beachland will surely be attracting the youth from around the world to witness this music festival. Given below are the details of the show including the ticket prices for the Dunes Beachland Festival. Jean Marie and Daniella will be the two headliner artists for the show. A live session of both techno and deep house music will lit up the show.